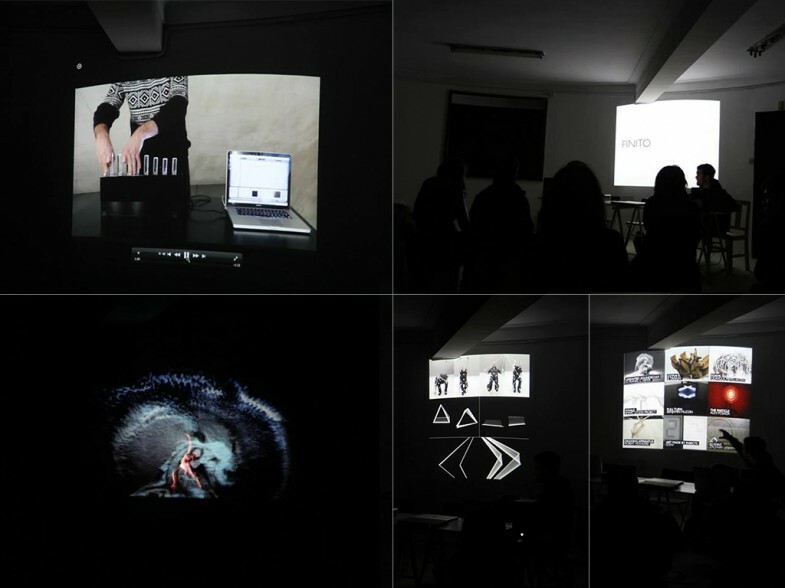 Between October and December I took part of an artistic residence at 1ºAvenida building, at Porto/Portugal. I had a studio there, and I used that time and space to continue my work and research on interactive visuals and on the relations between Sound, Visuals and Movement. Below there is a list with some of the highlights and outcomes from those 3 months. Sound and vision explorations with the goal of the creation of audio visual content for the Boris Chimp 504‘s performance. AudioReactive visuals made on Quartz Composer. More pictures at the flickr gallery. Video animations mapped into hand drawings from Porto’s landscapes. Check the project page for details.Made with Jose Cardoso. 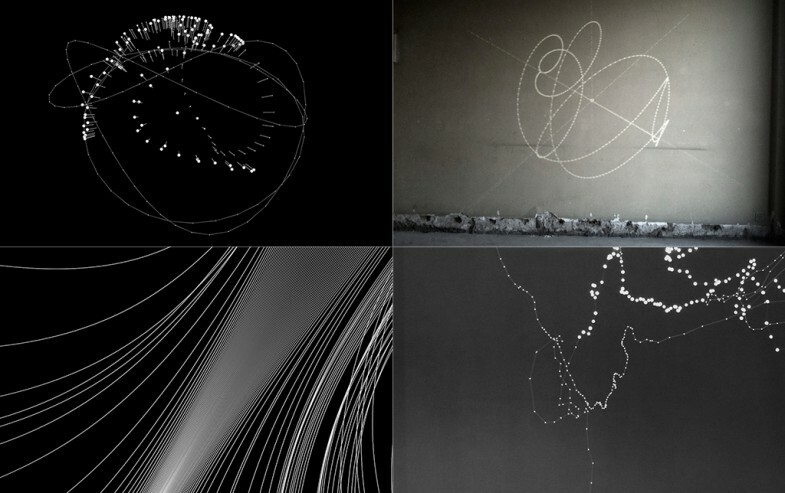 Exploration of an interactive system between movement and visuals. Prototype for a possible future project. The body is tracked with a kinect 3d camera and the visuals are generated with Quartz Composer. Work in progress, made in Quartz Composer. I organized a small informal conference focused on the relations between Sound, Visuals, Movement in real-time and interactive audiovisuals. I invited 3 artist, João Beira, Diogo Tudela and Filipe Lopes. Everyone one of them (and me) gave a lecture related to their work. 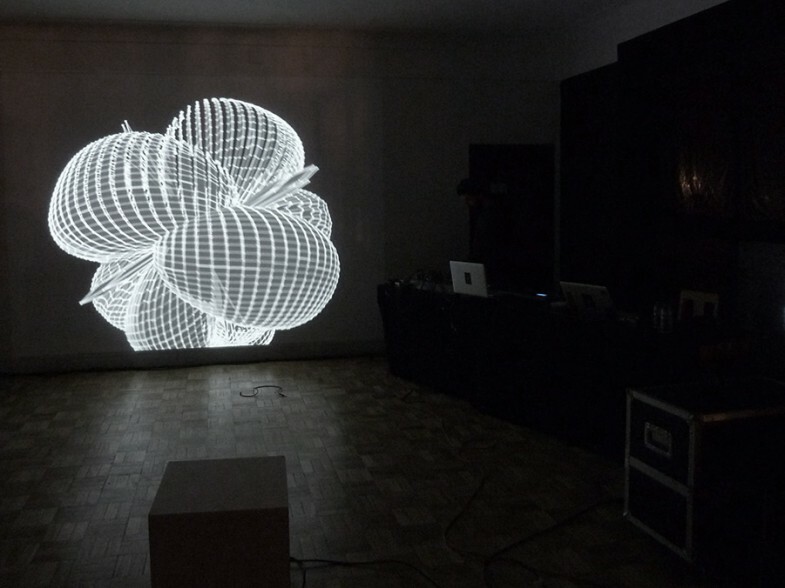 Interactive Audiovisual Installation. Visualisation of a group of particles who live inside an audio-reactive simulated physics system. The system is composed by several gravitational fields that react to sound. The attract/repel forces of each gravitational field are related to the sound frequencies (analysed in real-time). The forces make the particles move around the system, creating this way a visual relation between the sound and the particles’ motion. More info at the project page. 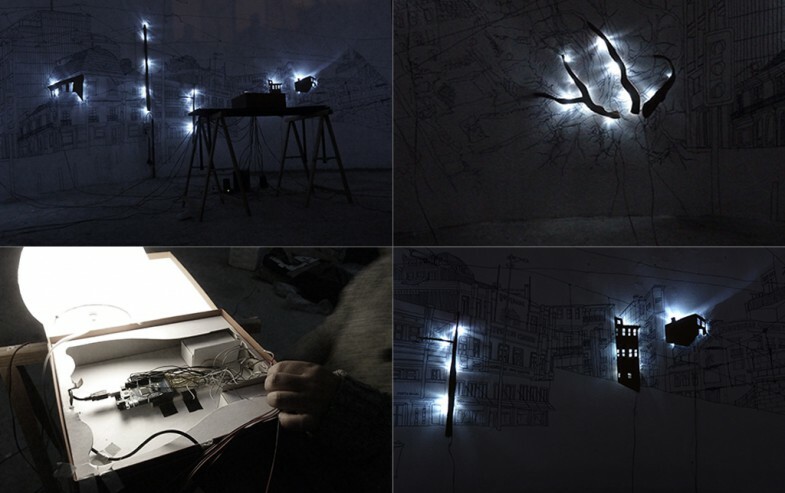 A physical interface controls a series of LED lights placed over a hand drawings of Porto’s landscapes placed on the wall of the exhibition room. Pieces of carton board over layers hide the LED’s and provoke a game between lights and shadows over the drawings. Made with Jose Cardoso. On January 4th I performed, together with Miguel Neto, our A/V live act BORIS CHIMP 504. An audiovisual real-time performance that emphasizes audio synthesis and graphical languages in a futuristic Sci-Fi aesthetics. It’s a real time interactive/reactive system between the audio and the image, between the man and the machine.